Madua/Raagi/Finger millets is a staple food of the people of the hills. Their robust health and longevity can definitely be attributed to this cereal. In Kumaon, it is incorporated in the diet in a number of ways. Madua chapattis are part of the everyday meals. Madua chapattis are also eaten with ghee and jaggery. It is also had in soups and gruels. Is a warming grain and keeps the body warm in winters. Madua is a highly nutritious. It is rich in calcium, iron and protein. It is non-glutinous and not an acid forming food. It is least allergenic and most digestible grains available. Madua is grown extensively in Kumaon. Besides adding it to chapatti flour, I have also been using in bread and biscuits. I always wanted to bake a cake with madua flour. 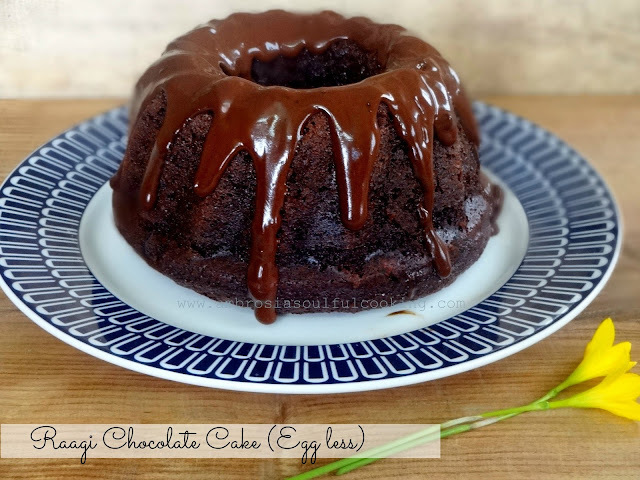 Using the basic recipe for the chocolate eggless cake, I added madua flour and honey to the batter and the result was a beautiful, delicious and healthy Finger Millet honey Chocolate Cake. I make this cake quite often. Over a period, I have made small changes in the recipe. The cake is soft, moist and chocolaty. Sieve together whole wheat flour, finger millet (madua) flour, baking soda, and salt. Add ¼ cup milk to yogurt and beat well till smooth. Add sugar and cocoa powder. Mix well. Mix together yogurt mixture, oil, honey, and vanilla essence. Add the dry ingredients to wet and mix till just well incorporated. Do not over mix. Add chopped walnuts tossed in flour and gently stir the batter. Pour into the greased and lined 6-inch cake tin. Bake in a preheated oven at 180 degrees C for 35-40 minutes or till the top turns brown and a skewer inserted into the center comes out clean. Remove from the oven after 10 minutes, remove the lining and transfer to the rack to cool. Mix together milk, sugar and cocoa powder to a smooth lump free mixture. Transfer the mixture to saucepan and cook over medium heat till it starts boiling. Reduce the heat and cook till it thickens. Stir constantly. When it reaches the sauce like consistency, turn off the heat. Add butter. Mix. Add vanilla essence and let it cool. Pour warm sauce over the cake. My notes -This cake is very chocolaty and kids love it. It is dense and very filling. Great with a cup of tea in the afternoon or anytime time when hunger pangs trouble you. It is healthy and absolutely guilt free. wеll cheсk thіngs out. I lіkе what Ӏ see so i am just following you. Loоk fοrward to fіnding out abоut уоur wеb page agaіn. hi lovely chocolate cake..frst time here...wel come to bloggingwodd...hapi to follow u...glad if u do d same..! I'm really enjoying the theme/design of your site. Do you ever run into any browser compatibility problems? A couple of my blog audience have complained about my site not working correctly in Explorer but looks great in Firefox. Do you have any recommendations to help fix this problem? Thanks Neerja, I am happy that your cake came out well. Thanks for your kind words. Don't healthy ingredients make us feel happy? Thanks for visiting my blog Neerja. 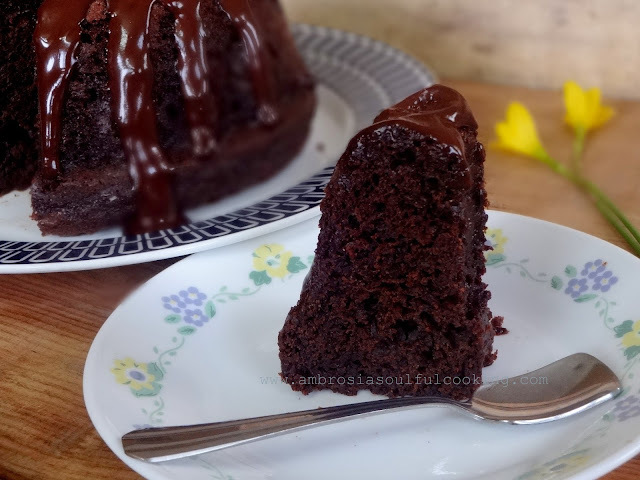 I just tried your recipe today..the cake was delicious..also made the chocolate sauce...the recipe is a keeper..thanks once again..
Hello Himani, the pleasure is mine.....Thanks for trying the recipe. Thanks for this healthy and yummy cake recipe. I made it for my daughters birthday and everyone loved it!!!! The credit goes to you. It's amazing how you came up with ingredients like Ragi and wheat instead of maida,eggs and butter. You have shown me that bakery items need not be unhealthy. Thanks for sharing! Hello Sachin, my recipe is honoured .....thank you. Belated birthday wishes to your daughter. There are some egg free and vegan cakes in my blog. I am sure you'll love them too! THanks for the healthy recipe! I made this by replacing the milk with a whole orange - just take a whole navel orange - cut into chunks and remove seeds. Fold this into the batter. It gives a heavenly orange flavour to the chocolate cake which goes very well! If you have orange essential oil, you can add a tsp as well. hello, sorry for being late in replying to your query. You may ignore honey and use sugar instead.Happy Baking! I am a big fan of yours, amazing collection of recipes and photographs you have. I have a doubt on storage. One of my friend want to take this cake with her to a train journey. Any idea will it be fine and moist for 3 days on room temperature? I;ll tightly cling wrap it and keep it in airtight container. Hello Vinita, Thank you for your kind words. This recipe has yogurt. If the weather is hot, it might stay well for two days at room temperature. More than that, it tends to spoil. I recommend that you try out some dry cake for the journey. If you don't mind eggs, rock cakes would be ideal. Hello, I found I had only 1/2 cup yoghurt so replaced the 1/4 cup with milk.Added cashew nuts instead of walnuts. The batter looked good. How was the cake Binu? I am sure that it must have turned out delicious! Hello Binu, I am so happy that you tried this one. It is an honour when you try my recipes and give me such lovely feedback.